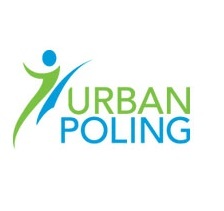 Urban Poling Inc is please to announce that both the Industrial Design Patent for the CoreGrip in Canada, Australia, UK and US (pending) and the Utility Patent for the ACTIVATOR Poles with the International Patent Office have been approved. Over the past 6 years, occupational therapist and founder Mandy Shintani along with co-owner Diana Oliver and operation manager, Jocelyn Clennett have been working with industrial design engineers, therapists and an ergonomist to produce and test our unique design so that it maximizes core strengthening, off-loading and weight-bearing. 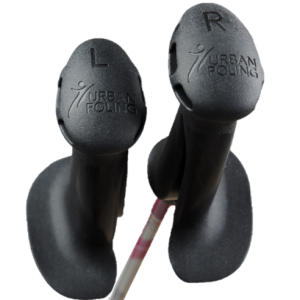 Palm (top) – Provides an effective alternative hand position to reduce grip fatigue, for off-loading weight when descending, and for propelling during long distance trekking. Large R and L identify the right and left handles. Central Column – The ergonomic design allows for a loose grip, and the texture helps sweaty hands to grip. Ledge – Allows more-even distribution of weight across the outside edge of the hand. Allows for comfortable and effective application of force for core strengthening and off-loading of weight. Supports the wrist in a neutral position.